Sunday, November 17th was the 109th edition of Toronto's Santa Claus Parade, one of the biggest annual parades in the world, and it happened right in York County - the same county where my Guideposts' A Cup of Christmas Cheer story, Riding on a Christmas Wish, is set. 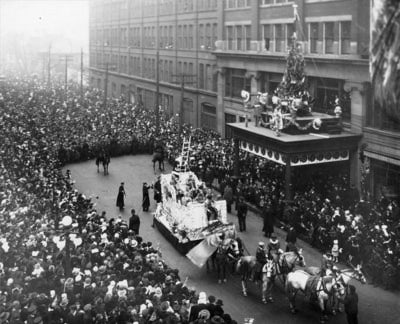 My story takes place in December 1911 and by then, the Eaton's Santa Claus Parade was already in its 6th year. Like other Christmas/Thanksgiving parades, Toronto's Santa Claus Parade was a department store promotion to show everyone that Santa Claus had arrived in T. Eaton's huge downtown store. The Ask.com website describes the occasion on December 2, 1905 this way: "In 1905, the Toronto Santa Claus Parade premiered when a single float carrying Santa Claus arrived at Toronto Union Station and made its way to the downtown Eaton's department store where Santa shook hands with Timothy Eaton." 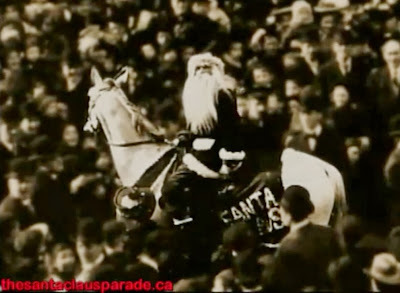 The above photo is a screenshot from the History of the Toronto Santa Claus Parade Part 1 video available on YouTube at http://youtu.be/_whj_sJ1Evc where you can find the following parts as well. Lots of information, historic and current photos, and archival footage. According to an internet article at www.citynew.ca "The parade was the longest in both distance and duration from 1910 to 1912 when the jolly old elf started his journey downtown from Newmarket on a Friday afternoon, stopping overnight in York Mills and then heading down Yonge Street on Saturday afternoon." Newmarket is 26 miles north of Toronto. Another 12 miles further north and the parade would have started in Keswick where my story is set. The Archives of Ontario has an online exhibit, Eaton's Santa Clause Parade with images, archival footage, and even a printable copy of the 1957 Eaton's Christmas coloring book. I found this Toronto Santa Claus Parade 1927 version to be quite funny, although it is silent. It also has some of the large heads mentioned farther down in this post when talking about the Michigan Thanksgiving Parade. In 1975 while stationed in Kingston, Ontario, I took the short drive west to Toronto to see the Santa Claus Parade live. After years of watching it on TV, it was both a surreal and eclectic moment in time. The crowds were noisier, the floats bigger, and some of the people were downright strange to my naive eyes, although my friend, a native Torontonian, didn't even spare a glance at the cross-dressers. But to actually be there for the annual event was something I treasured. I believe the people who are in attendance for Macy's Thanksgiving Day Parade or other huge parades know what I felt that day, especially if they watched it on TV for years first. Also in 1924, the J.L. 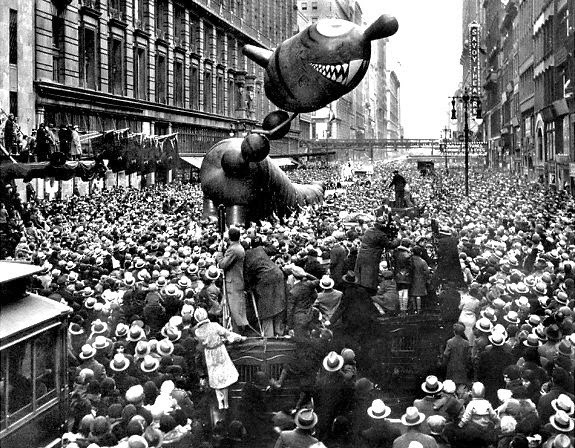 Hudson Company Department Store started a Thanksgiving Day Parade but they put their own twist to it. Wikipedia states, "The idea came from Hudson's display director Charles Wendel after the success of the Canadian Eaton's Santa Claus Parade in Toronto, Ontario. In addition to the usual floats and bands, Wendel obtained large papier-mâché heads similar to those he saw during a recent trip to Europe. The heads are made in Viareggio, Italy, and remain a fixture of the parade to the present." I Love a Parade has a whole bunch of old photographs like the one above of The Michigan Thanksgiving Parade, also known as America's Thanksgiving Parade. Finally, the distinction for being the oldest U.S. Thanksgiving Parade goes to the Gimbels Thanksgiving Day Parade, now known as 6abc Dunkin' DonutsThanksgiving Day Parade. 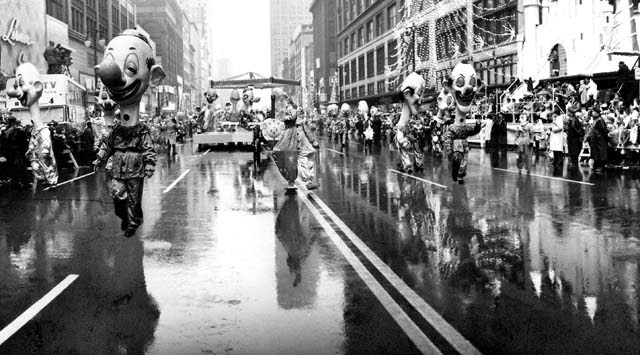 Have you ever been to a Santa Claus or Thanksgiving parade? Share your memories - or wishes. I've never been to a Thanksgiving/Christmas parade. My dh's college roommate was from Brooklyn, so one year he went to P's house for Thanksgiving -- and they went to the Macy's parade. I wonder if he was there during one of the mishaps. Several have tangled with lamp posts, and others have leaked. It sure would have added a different element to the occasion. Thanks for popping in, CJ. Cool. I hadn't heard of it before. Dina, are you referring to the Toronto Santa Claus parade, or Thanksgiving parades in general? And for some reason, that reminds me that while researching this post, upon reading that the NY parade goes down 34th Street, an image of the holiday movie, Miracle on 34th Street came to mind - a stroke of genius for promoting Macy's Thanksgiving Day parade although I don't think the department store was behind it. So T. Eatons must have been the Canadian version of Sears & Roebuck. That's fun to think about. I've never been to a Thanksgiving or a Christmas parade, but my uncle has marched in a few in New York with his high school's band (he's a music director). When we were in NY this summer he showed me the St. Patty's Day parade route. NY is already so crowded I can't imagine being there for a parade! Eaton's sent out it's 1st catalogue in 1884. Simpson's put theirs out 10 yrs later when Eaton's had pretty well cornered the market. The 2 plied for Canadian business from then on. 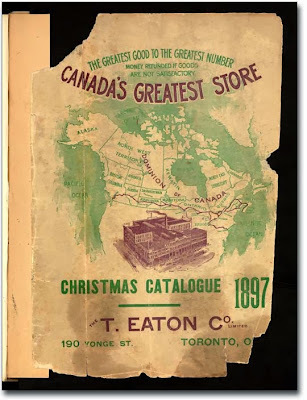 Eaton's business savvy created different catalogues for different industries, so the fishermen of the Maritimes would have one with clothing they needed, while miners in the Yukon had one with equipment they required. In 1976, Eaton's put out it's last catalogue and very recently, the company closed its doors altogether. As mentioned above, Simpson's merged with Sears-Roebuck and then sold it's Sears catalogue division in the 1980's. You can find Simpson's downtown in the larger Canadian cities. We receive many Sears catalogues during the year, but the best one is the Wish Book that comes out at the start of September and immerses us in pages and pages of everything Christmas from specialty food trays to send to far-off relatives, to decorations, toys and furniture. Every hick town in Canada right up to the Arctic Circle and farther has a well used Sears Outlet. You can furnish a compete house through it's pages. Timothy Eaton used to even sell house kits in his catalogues way, way back, and you can still see them dotting the prairies. I've heard of Eaton's so I guess that means I live close to Toronto, eh? I never had any interest in going to the Macy's parade but I love going to NYC between Thanksgiving and Christmas! And I feel like I've missed something if I don't see any of it during the day ( must peek in from the kitchen). my big PARADE dream is to see the Tournament of Roses Parade and all those floats in Pasadena. You have quite a post here - super photos and videos! 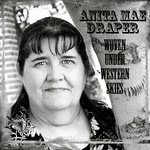 Very cool, Anita. Sadly, I have never been to a Christmas or Thanksgiving parade. But I loved reading about the history. Thank you!